There is growing evidence that all patients with migraines should be evaluated by an upper cervical chiropractor using upper cervical procedures. See the other articles in this series, Is my migraine actually a migraine? and Migraine treatments, from natural to alternative. Why examine the neck for migraine head pain? In many patients with migraine and other forms of primary headache, there seems to be a link between their symptoms and their neck. For example, when the muscles of the neck are addressed by a massage therapist, or the mechanics of the neck are improved or corrected by a chiropractor, the symptoms can lessen or go away. This is especially the case for patients who are not helped by over-the-counter or prescription migraine headache treatments, or who cannot tolerate the side effects. As was explained in the other companion article to this one, patients with migraine headaches are commonly found in the chiropractic office. And many people with migraine find chiropractic adjustments helpful at helping reduce the intensity and frequency of their migraine headache attacks. If migraines are a problem, then it’s worth considering a consultation with a chiropractor who understands and is prepared to help you with migraine headaches. Case reports and some research trials have shown positive responses of migraines (even severe migraine cases) to common chiropractic adjusting procedures like Diversified and Gondstead. For example, this one extreme case of Severe Hemiplegic Migraine, which included facial tingling, temporary paralysis, and other symptoms generally associated with migraine, which resolved after Diversified adjustments. However, it’s my personal belief that chiropractors who have received training in the upper cervical procedures, and use one or more of these procedures as the basis of their practice, is the optimal place to start if you experience migraine headache pain. 1. There are direct tissue connections between muscles at the base of the skull (upper cervical region) and the spinal cord. I will say that again in a different way: there’s a literal connection between muscles at the top of your neck and your spine cord! This may play a primary role in development of many kinds of headache pain. Because upper cervical procedures use precision x-rays of the junction of the head and neck, we tend to have a different understanding of what’s happening in that area. See: Anatomic Relation Between the Rectus Capitis Posterior Minor Muscle and the Spinal Dura Mater. 2. New research has shown that upper cervical alignment can influence and affect blood flow and cerebrospinal fluid (CSF) flow in and around the brain. The pulsatile (pounding) nature of migraine could be explained by inflammation in blood vessels in this sensitive area of the head. Upper cervical chiropractic adjustments using the upper cervical procedures have been shown to change these blood and CSF flows (1). 3. Upper cervical procedures are capable of unlocking/releasing many mechanical problems in the the neck, and even further below in the spine without aggravating the neck. Adding to the growing body of evidence supporting the safety, efficacy, efficiency and patient satisfaction regarding upper cervical chiropractic techniques is the recent publication of “Symptomatic reactions, clinical outcomes and patient satisfaction associated with upper cervical chiropractic care: A prospective, multicenter, cohort study”. This latest research project, by the prolific Orthospinologists, Kirk Eriksen, D.C. and Roderic “Bo” Rochester D.C., uniquely validates and differentiates upper cervical chiropractic care from other chiropractic techniques and spinal manipulative therapy (SMT), while further documenting its remarkable effectiveness and efficiency. Some of the outstanding clinical outcomes of the study include noted improvement in headache pain at 62.8%, in cervical spine pain at 56.8%, in thoracic spine pain at 58.6% and in lumbar spine pain at 57.0% in approximately 17 days. A summary of the research is here. Finally, I have my own experience as an upper cervical chiropractor. 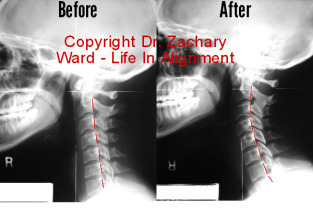 Throughout this article you’ll find feedback forms of four different migraine patients who received gentle adjusting procedures in the neck and the upper cervical spine from Dr. Zachary Ward here in our office. While some migraines are complicated and take some time to decrease in frequency and intensity, there is no downside to investigating whether upper cervical procedures may be helpful in your case. It’s easy to request a consultation online here. Misalignment, Obstruction of Cerebrospinal Fluid Flow, Cerebellar Tonsillar Ectopia, and Image-Guided Correction in Smith FW, Dworkin JS (eds): The Craniocervical Syndrome and MRI. Basel, Karger, 2015, pp 48–66 DOI: 10.1159/000365470.